The San Mateo County coast and Half Moon Bay area are rich with activities and natural beauty: folksy annual events including the world famous Half Moon Bay Art & Pumpkin Festival, tidepooling, surfing, hiking, mountain biking, fishing, boating, whale watching, golfing, horseback riding and camping. Visit beaches and parks, farms and nurseries, pumpkin and Christmas tree farms, wineries, flower and farmers markets, or meander through the many small shops on charming downtown streets. This is a true piggyback ride. As the story goes, the boy had two pigs. Often times he would ride one around the farm in Half Moon Bay. 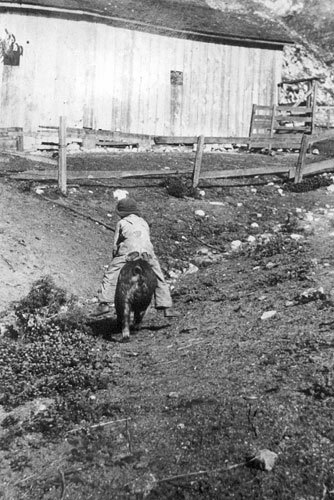 One day, he jumped on the wrong pig and ended up being knocked off and attacked escaping with only minor injuries. The saying goes, "The hog is the mortgage lifter, the sheep the farm fertilizer, the cow the barn builder and the hen the grocery-bill payer. This quartet, with a man and a women not afraid of the work is caring for them will insure prosperity on any farm."